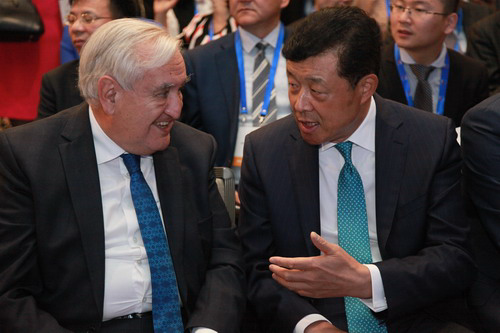 It is a real pleasure to join you at the Seventh Sino-European Entrepreneurs Summit. 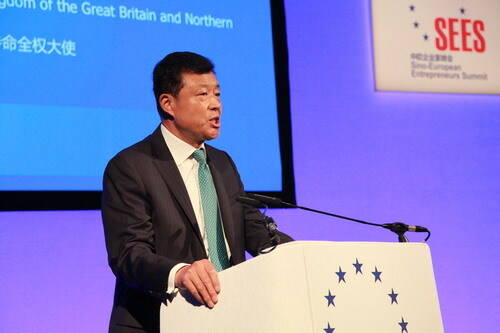 Just a week ago, I attended the Second China-UK Business Leaders Summit, and today the Sino-European Entrepreneurs Summit. These two events taking place in succession in one week are not mere coincidence. Both Summits sent a clear, unequivocal message that the Chinese business community attaches high importance to cooperation with British and European partners. But talking about coincidence, there is indeed one. Here in London today, it is just ten days before the UK referendum about Europe. 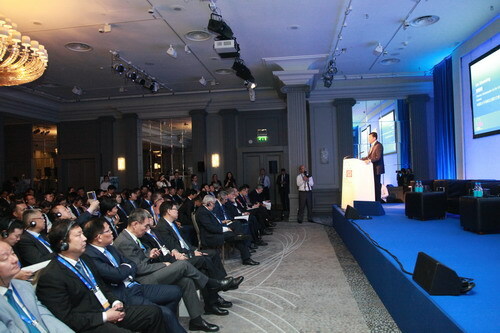 Yet, Chinese and European business leaders are coming together to discuss about the future of China-Europe cooperation. What a coincidence! Of course the referendum is not the topic for the summit today. However, the UK, as part of the EU at least for now, is bound to be an inevitable subject. So is UK's relationship with the EU. First, China respects the choice of the British people. Second, China would like to see a strong and prosperous Europe. Let me now turn to today's topic. The theme of the summit today is "China's One Belt One Road Strategy: New Growth and New Opportunities". This is highly relevant as 2016 will continue to see China investing more efforts in the building of the "Belt and Road". The "Belt and Road" is a major initiative that China has taken to deliver its overall opening-up strategy. It has been rolled out at a time unprecedented in history. Today, the global economy has become highly integrated. Linked to that is a fine division of labour. This means that countries around the world should open up markets and engage in international cooperation in order to achieve development. l The "Belt and Road" Initiative will effectively promote the trade and investment cooperation between China and countries along the routes. l It will greatly facilitate the cross-border flow and integration of capital, technology, information, professionals and other key factors. l And it will boost common development and generate new impetus for a speedy world economic recovery. l The Belt and Road could become a new source of growth for China-Europe cooperation. l In turn, with both China and Europe taking part, the "Belt and Road" would gain powerful "twin engines". l And this will help power up the "Belt and Road" projects. The UK is an important member of the EU. It is China's major trading partner and investment destination in Europe. Its many unique advantages mean that it has a key role to play in the building of the "Belt and Road". First of all, Britain is strong in R&D and innovation. It is a world R&D and design centre for high-end science and technology and high value-added industries. China is a major equipment manufacturer and has considerable strength in infrastructure building and financial resources. Chinese and British businesses can dovetail their respective strengths and enhance international capacity cooperation in advancing the "Belt and Road". Second, the UK has an advanced modern service sector. It is a global centre of finance, trade and specialized services, and it has the fastest-growing RMB offshore market. Five days ago, I attended the listing ceremony of the Chinese government-issued RMB sovereign bond in London. This was the first time for China to issue sovereign bond overseas. The fact that London has been chosen for the first issuance is a clear reflection of London's important status as a global financial centre. It means London is capable of providing quality services to countries along the "Belt and Road" in finance, accounting, legal service, consulting and marketing. In one word, much can be achieved from the win-win cooperation between China and the UK as we join hands to advance the "Belt and Road". "Mutual understanding makes great friendship." It is my sincere hope that, in the spirit of cooperation, entrepreneurs from both China and Europe will explore the opportunities and work together for a promising future. I am confident that your cooperation will help boost the growth and prosperity of China and Eruope. Your joint efforts will promote the development in the countries and regions along the "Belt and Road" routes. And together, your will contribute to a Eurasian market and Eurasian community that is unprecedented in history. In conclusion, I wish the Sino-European Entrepreneurs Summit a complete success!